If you are someone who uses a self storage unit throughout the year, then you are going to want to make sure that your items are well protected from the elements. This is especially true if you live in an area of the country that experiences seasonal extremes, with high heat and humidity during the summer, and crushing cold during the winter. Below are five ways to protect your stored goods from the elements. 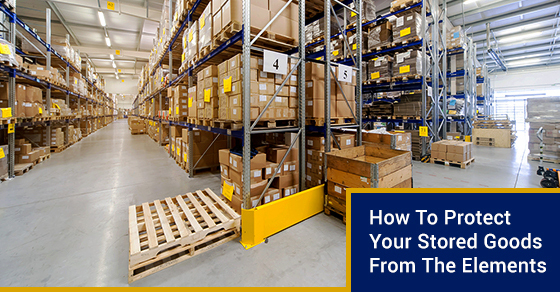 Your first line of defence should be to place everything on pallets so that it is up off the ground. During the winter, ice and snow melt may find its way under the door of your self storage unit. Water is insidious and we all know how well it can make its way through the smallest of cracks and crevices. Some things are more susceptible to damage by the cold, others to heat damage. If your stored goods require a constant room temperature year round to ensure that they remain in full working order, your best bet would be to find a self storage facility that comes with climate controlled units. This is especially important if you are storing items that may fall victim to insect damage. If you are storing wood furniture or clothing, make sure that everything is properly wrapped so that insects, and the damage they are capable of wreaking, don’t become an issue for you. In addition to climate controlled environments, you can also invest in insulation, or even insulated boxes to make sure that your goods are protected. If you are unable to secure a climate controlled environment, the best option is to make sure that your packaging material has insulating properties. If you plan on keeping items that must avoid water at all costs (like electronics) in storage for extended periods of time, you may want to invest in some waterproof boxes made from rubber or hard plastic that will help protect against water damage. Traditional cardboard boxes are well and good for the short hall, but they are not immune to water and water damage. Protecting your stored items when you place them in self storage is extremely important. Simply throwing things in without really considering their storage needs defeats the convenience of a self storage unit in the first place. Make sure that your belongings are stored safely and correctly by following the above four pieces of advice.